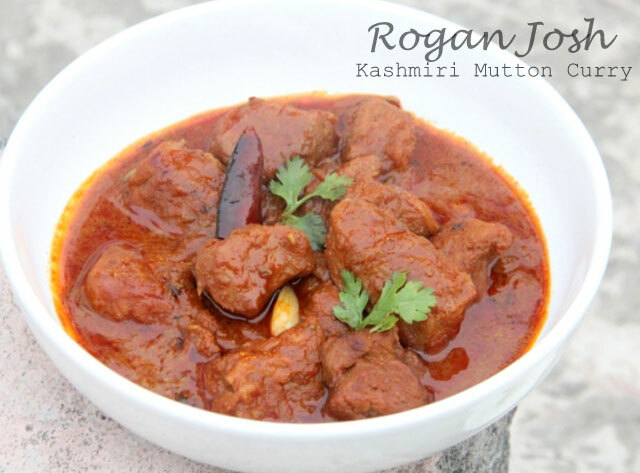 Mutton Rogan Josh recipe, the quintessentially spicy Kashmiri mutton or lamb curry to spice up a winter lunch or dinner. 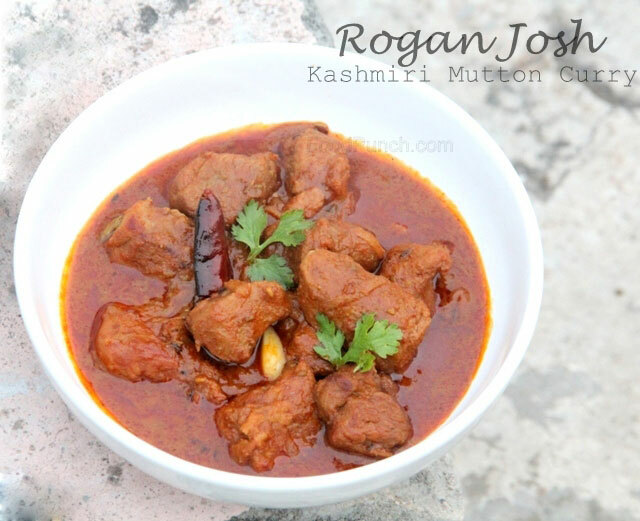 It needs no introduction, the famous mutton or lamb Rogan josh recipe from Kashmir finds an inclusion in almost every North Indian restaurant’s menu. 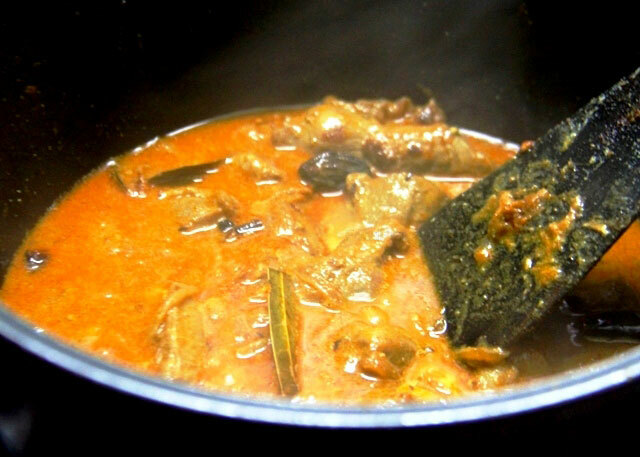 It is intensely flavourful, spicy mutton gravy that’s believed to have originated in Persia and was perhaps brought to India by one of the innumerable invaders. 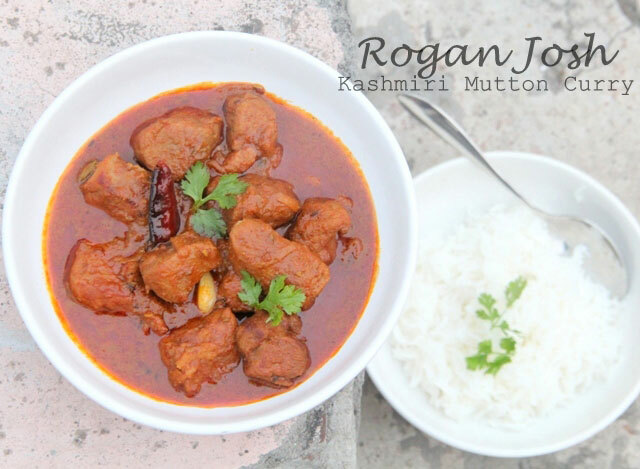 But I don’t concern myself so much with the history as I do with the flavours, the intense colour and heat of the signature Kashmiri chillies, dried ginger, and fennel seeds together add an aroma that I’ve grown to associate with the Kashmiri style of cooking. 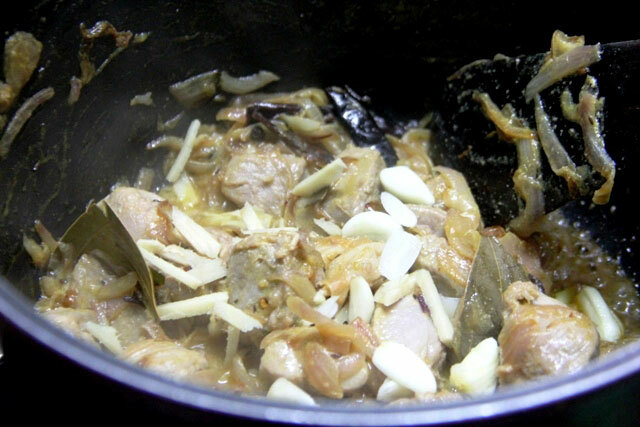 It is a very fragrant recipe, reminds me of the infamous one served at the Karim’s Hotel in Old Delhi, not that my recipe is as celebrated but as close as one could get, I’d say. Such blasphemy, comparing my cooking with one of the best places known to serve the Rogan Josh, unacceptable, and I apologise. But you won’t be disappointed in this home-made recipe, seriously how often can one travel to Karim’s even if one lives in Delhi, leave aside the geographical constraints. Having talked high and loud about the recipe I leave it on you to decide for yourself waiting to hear back from some of you atleast. 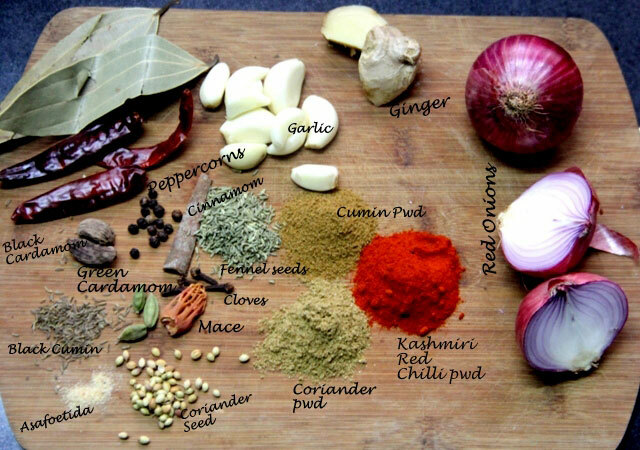 Anyhow the authentic recipe derives its colour from a spice called ‘ratanjot’, which is a difficult find and seriously the Kashmiri chillies adds enough colour. Rub the mutton with the lemon juice and a little salt and leave on for 10 mins. The add 2 tbsp curd and marinate overnight in the fridge or atleast an hour. 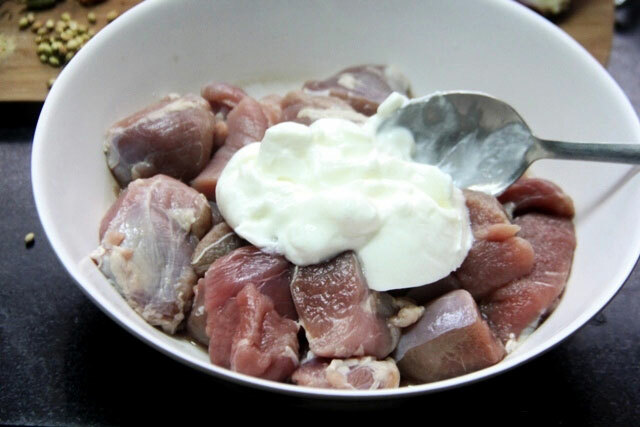 If leaving overnight do take the mutton out of the fridge ½ an hr before cooking. 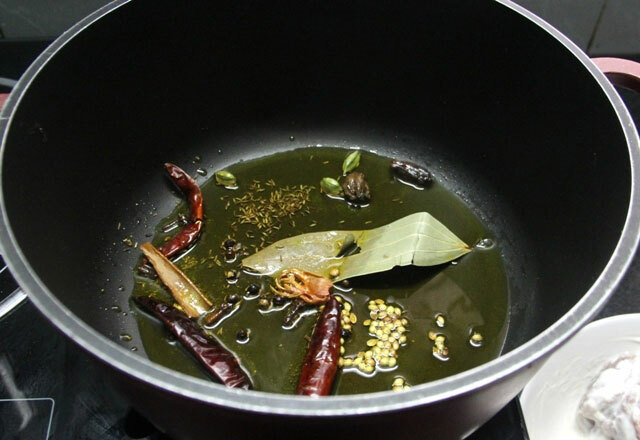 Heat the oil in a thick bottom cooking pot/pan, add the asafoetida, bay leaves and whole red chillies, just 5-10 secs later add all other whole spices except fennel seeds, and fry until they are fragrant. Be careful not to burn just allow to turn fragrant. 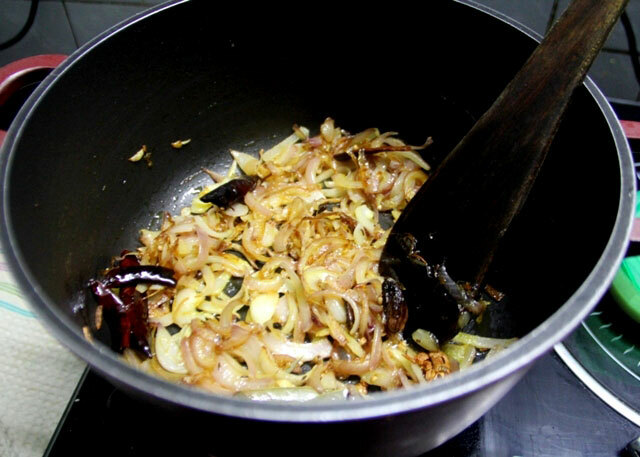 Add the chopped onions and fry until it is nicely golden browned. 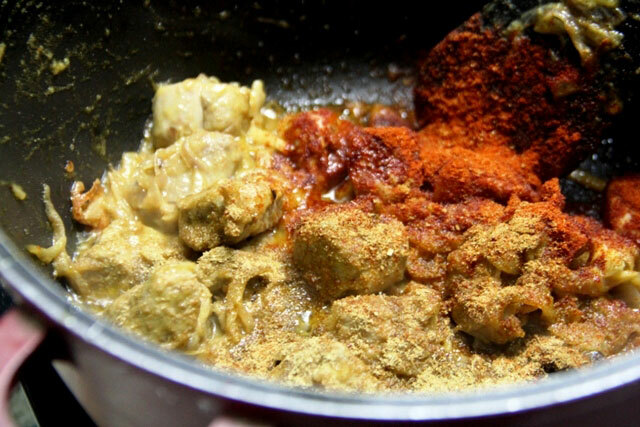 Add the marinated mutton pieces and fry together on high-med heat until the mutton is nicely browned, almost caramelised. It will take about 10 -12 mins, do stir from time to time. Then add the ginger strips, whole crushed garlic cloves and ginger garlic paste and fry together for another 3-4 mins. Then add the red Kashmiri chilli, cumin, coriander pwd and fry on a medium heat for another 3-4 mins. Add crushed fennel seeds and ginger pwd and fry until oil starts to separate along the sides. 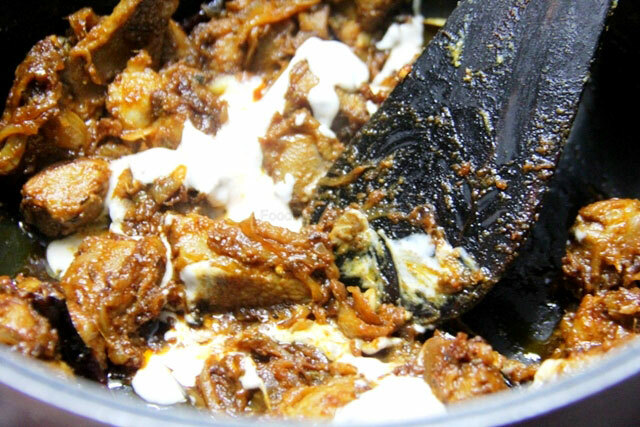 Beat the remaining curd with a pinch of salt and chilli pwd and add stir into the mutton in 2-3 batch, stirring continuously. 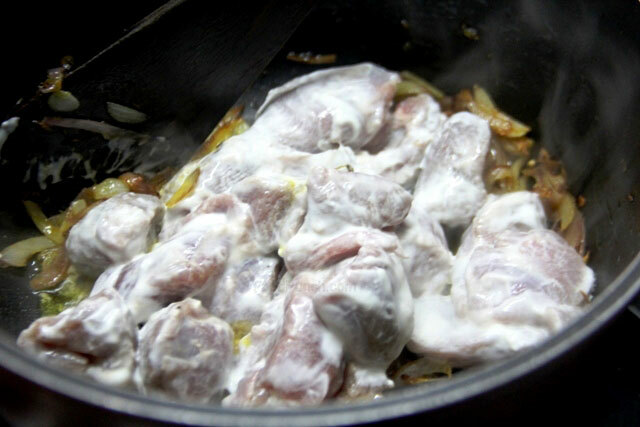 Fry for another 4-5 mins and add about two cups of hot water, enough to cover the mutton pieces. Simmer, cover cook stirring occasionally until the gravy thickens and the mutton is tender cooked. Once cooked turn off the heat, stir in the garam masala pwd and keep covered until ready to serve. Garnish with chopped coriander leaves and serve warm with rice or chapattis. 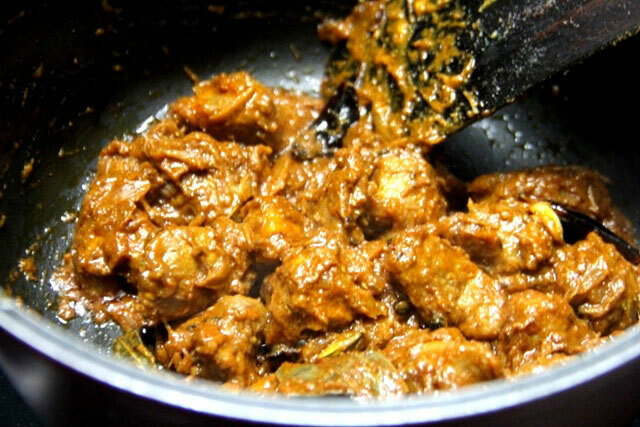 Do use with bone mutton pieces for an authentic dish. Adjust Chillies to taste; my whole red chillies were quite hot so I got a decently hot rogan josh at the end. You may us the oil of your choice but traditionally Mustard oil is used for its pungent flavour intensifies the recipe.